For those late to the party, Die is based around a group of youngsters who, in true Jumanji style, end up being sucked into a roleplaying game. Barely managing to escape the fantasy realmr and unintentionally leaving one member of their group behind, they find themselves being tricked into returning as world-wearing forty-somethings, and have to face up to the horrors of a world they thought they’d left behind for good. Over the course of the first two chapters we’ve met the main characters and had the basic premise of the series established, and now we get to walk around a little in the almost dizzyingly expansive world that writer Keiron Gillen has created. This latest issue sees our group of ‘heroes’ taking a short-cut through the warzone between two realms – Eternal Prussia and Little England – which, in spite of its brutal violence and almost unimaginable chaos – is somehow preferable to seemingly benign realm of Angria. Far from an upbeat “hey, let’s be wizards and warriors” style, this is pitch black fantasy of the highest order, and if the gruesome consequences of Ash’s naïve vow in the previous issue wasn’t enough, this latest issue sees Gillen twisting the knife as our deeply flawed and baggage-laden flawed forty-somethings have to cope with all that The Little England/Eternal Prussian front has to offer. Beautiful in both its subtlety and its obviousness, this issue sees Gillen twisting the established Tolkien style by relocating it to the trenches of a brutal warzone. Mixing the fantastical with the worst aspects of the real world perhaps isn’t anything new, but seldom has it been done as assuredly as it is here. With our party completely overwhelmed by a seemingly unstoppable Prussian steel dragon, Ash finds himself isolated from his companions, seeking sanctuary in a trench where he discovers the true face of horror. Gillen’s eloquent narrative and strong characterisation shines through on almost every page, but it’s Stephanie Hans’ artwork that really lifts this series to another level. Her rich, painterly style gives the book an almost ethereal quality at times, and the way she underscores the sadness in the brief-yet-tragic encounter in the trench ensures that the thrust of this issue is nothing less than heart-breaking. Likewise, Cowles’ lettering goes a long way towards making the emotional beats land quite as hard as they do, manging to be both inobtrusive and emphatic as the story demands. 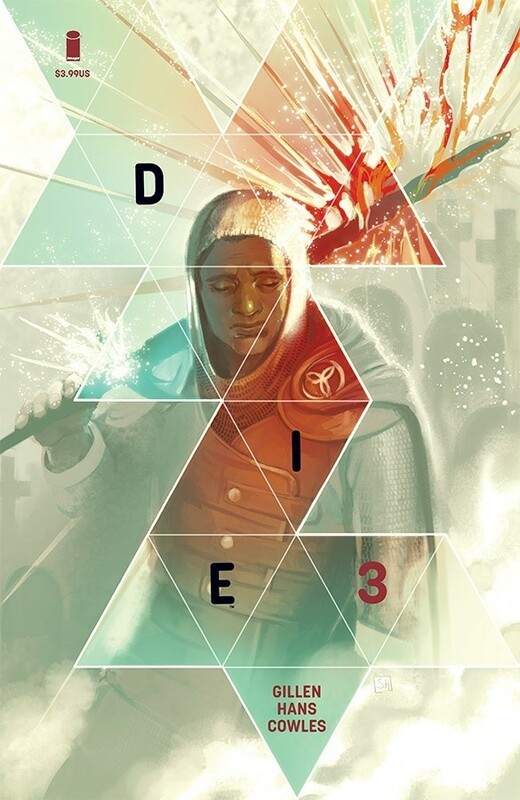 There’s a hell of a lot going on here, both on the surface and beneath it, and Die is most certainly a series that will reward repeat readings. What’s more, this feels like a genuine passion project from everyone involved, and that level of investment and affection is difficult not to become sucked in by, particularly in what is starting to feel at times like an increasingly disposable comics industry. Gripping, emotive and profoundly moving, this is a new series I can’t recommend highly enough.